I have no interest in people, says Lothar Götz. What he really means is he has no interest in making images of people. In reality his work is generous and humanist. He says it is incomplete without people, they are vital to its reading and success. The work is for and about people, their understanding of and place within space, architecture. His work highlights and exemplifies a very current problem. It is not for screens. Sections of it provide colourful backdrops to the constant stream of selfies but they give no idea of the physical experience of being with his work. Photographs of the work reduce it to a picture. It maps and unfolds space. It colours the air around it and reflects and absorbs the light in the room. The work here, his largest wall painting to date is 42m (138') long and 5m (16') high. It wraps around a large T-shape section of wall which divides the gallery into 3 spaces. These walls are a permanent part of the gallery. They partition the large open warehouse type space into two gallery spaces and a long corridor. Götz makes the walls the work. They become a large, freestanding sculptural lump within the space. Through his colouring of the wall these walls boom 'in' the space, not 'of' the space. The painting is never visible all at once, the viewer needs to circumnavigate the whole space of the gallery to see the full work. Each space has a different character. The work is superficially fast at first glance, huge graphic areas of rich colours which meet with the sharpest of edges along parallel diagonal lines. They amplify the architecture of the space and add a dramatic direction, movement. It is unreproducible. The same colours re-occur throughout the spaces but appear to be different in the varying combinations, encouraging the viewer to re-explore the spaces and refer back to colours already encountered. The work demands a visit, commitment, time, prolonged viewing. The work is generous and rewards the time spent with it. The exhibition also includes 5 large paintings and a series of smaller paintings and drawings. 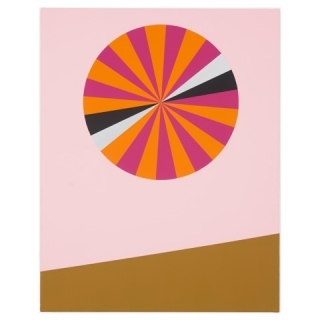 David Risley first exhibited Lothar Götz in 2001 at Zwemmer Gallery, London and in 2002 in a large group show titled Love on Wharf Road, London. The paint for the wall painting was generously sponsored by File Under Pop.